Water in Your Shower Not Hot Enough? Is the water from your shower not coming out hot? There could be several reasons for the problem. Nothing beats a nice, hot shower during the winter time to warm your bones. A shower ought to be counted on to provide hot water whenever you need it. 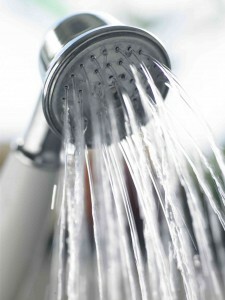 Your shower water is heated by your water heater, where it starts its journey to your showerhead. So if the water in your shower is leaving you in the cold, there are a few places to check in order to find the problem. One place where the problem might be is at the very start of the hot water process in your water heater. If the water temperature in your shower never gets warm, check the temperature setting to make sure it is set correctly. Newer water heaters may have had their heating elements faulty or burned out in some way. This may prevent it from providing a consistent flow of hot water. Check to see if the problem is occurring in the entire house by turning on all of the hot water faucets in your home. If they all start hot but fade quickly, you may have a problem with the burner in your water heater. But if there doesn’t seem to be a problem with your other faucets, one of the shower components may be to blame. A shower valve mixes hot and cold water to provide you with your desired water temperature. The valve may not be able to properly mix, however, if the O-rings or washers have worn out. This is usually a pretty simple and inexpensive fix. In older homes, cross-connected pipes were used to balance hot and cold water flow. If you have a hand sprayer in your shower and it gets hot when the regular shower turns off, you should contact a professional plumber to have this issue resolved. This is a more complex problem than the shower valve issue. Finally, consider the time of usage. If other members of your family are taking showers right before you or your washing machine is running, all of the hot water in your water heater tank may be used up before you get a chance to use it. Always allow half an hour after a shower or wash load for the water heater to replenish its supply of on-demand hot water. And if you’re still having issues, you may be in the market for a new water heater! This entry was posted on Friday, January 6th, 2017 at 5:21 pm. Both comments and pings are currently closed.